That was quite an acperience. 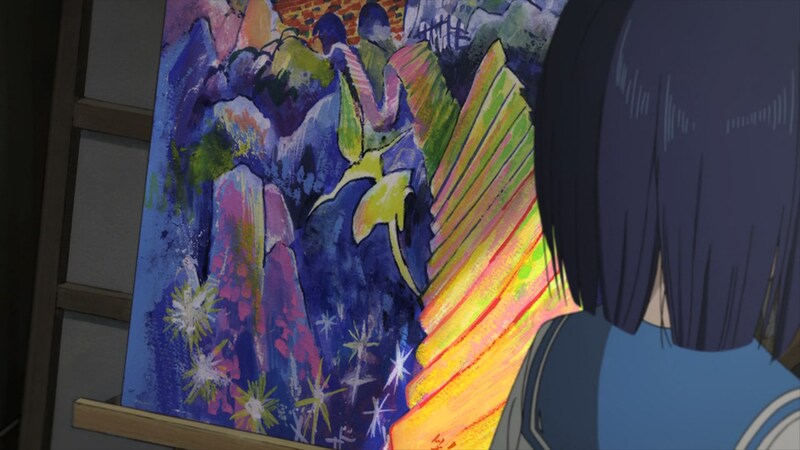 Flip Flappers continues its episodic ride. Each story is unique, and yet they all feel integral to the series. This episode might have been the biggest tonal departure yet, however; after a relatively standard beginning at the FlipFlap base and other familiar settings like the school, the mandatory fight against Yayaka’s team happened. Cocona and Papika then unknowingly wandered into the memories of their senpai from art club, through an ominous door within Pure Illusion. Her past is presented as a double-sided coin. One side shows her warm memories of her kind-hearted aunt with whom she spent a lot of time. The other side is linked to the cold and unpleasant memories of her parents, implied to at least be neglectful and in constant domestic conflict. Cocona and Papika find themselves living each of these parts, switching places and eventually seeing both threads intertwine – they’re the same person’s remembrances after all. This chromatic contrast, as well as using makeup as a motif, must have been planned as the basis of her arc since the very beginning; she’s called Irodori Iroha after all, a fact that was hidden even from the official site where she’s referred to as simply Senpai. As the episode progresses, some hints about her aunt becoming forgetful lead to the reveal that she’s suffering some kind of dementia, possibly Alzheimer’s. She once asked Iroha to remind her of her name if she were to forget it, a promise that she didn’t keep and still torments her in the present. Cocona and Papika, embodying the two sides of Iroha’s life, get the chance to finally tell her. 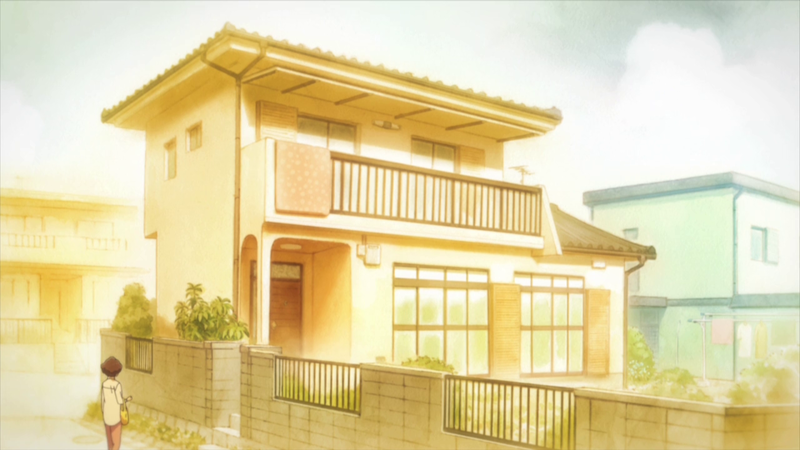 As the final scene demonstrates, that did have an effect on the real world and removed Iroha’s regrets – the powers at work here are unclear, but that might not matter at all. The storyboard artist Yuzuru Tachikawa is someone you must be very acquainted with if you were following this site last season. Mob Psycho 100’s series director is undeniably one of the most talented young directors in the industry, so his confidence while telling this story is no surprise; depicted in a way that’s not too difficult to parse, and yet leaves lots of space for speculation. 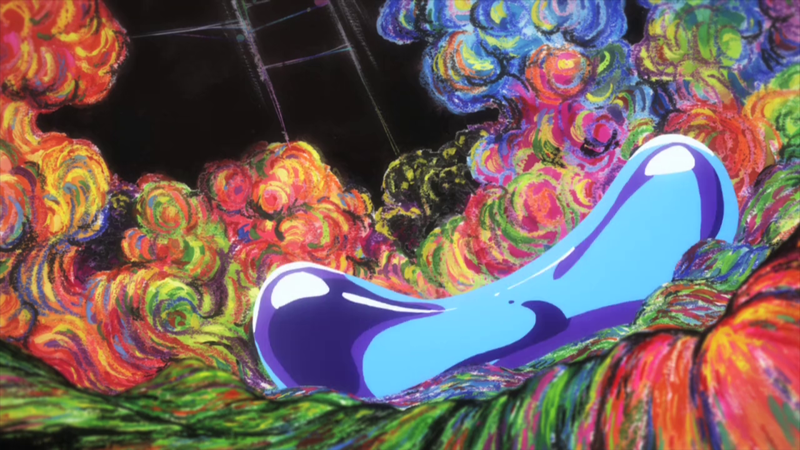 The use of warm and cold colors to illustrate pleasant and unpleasant memories in particular was very similar to what was shown in Mob Psycho, so he happened to be trusted with a perfectly fitting character arc. 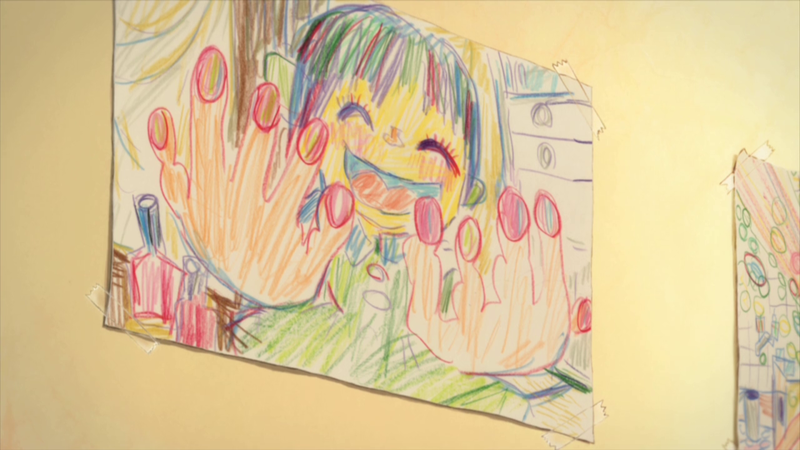 Episode 3’s director Hiroshi Ikehata returned to do Tachikawa’s storyboard justice. The animation director Shiho Tanaka has been working with 3hz since the studio’s foundation, and her companion this time around Hisako Tsurukubo already worked on episode 2. Studio Pablo’s work was especially outstanding on the short Pure Illusion segment, clearly reminescent of Iroha’s paintings in the real world. I assume the backgrounds were drawn with wax crayons. Very unusual technique to see in anime. The animation quality in this episode was what I’d call a Flip Flappers standard. Not too outstanding, but really solid throughout with some notable highlights. One name that I thought had been surprisingly absent from this series so far was Yasunori Miyazawa. He’s been working regularly with producer Matsuka since Code;Breaker and continued to do so after Studio 3hz was founded. Thankfully, he has finally made his appearance in this episode – and what a striking one! He animated the scene with Iroha’s parents, which was full of the grotesque deformations that he’s well known for. 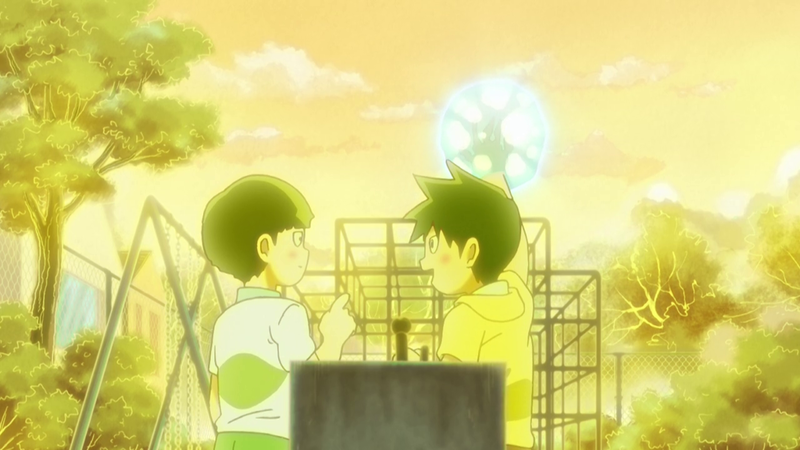 Yuasa mentions will be thrown around because of that scene, rather fittingly since they’re usual collaborators who deeply respect each other. One Punch Man’s character designer Chikashi Kubota animated the action scene in Pure Illusion, as sourced by the man himself on twitter. 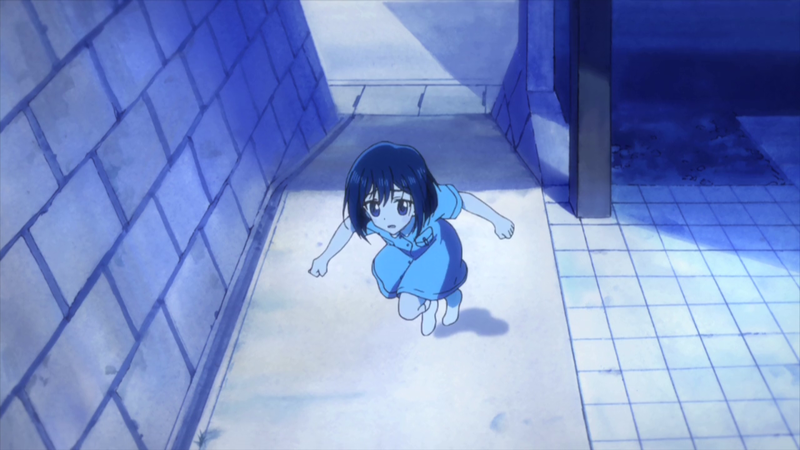 Another scene that I particularly loved was Iroha running away from her aunt, which featured some interesting photography work. I’m asking myself if I’ll be so lucky to cover two anime in a row without an outsourced episode. Don’t let me down, Flip Flappers! 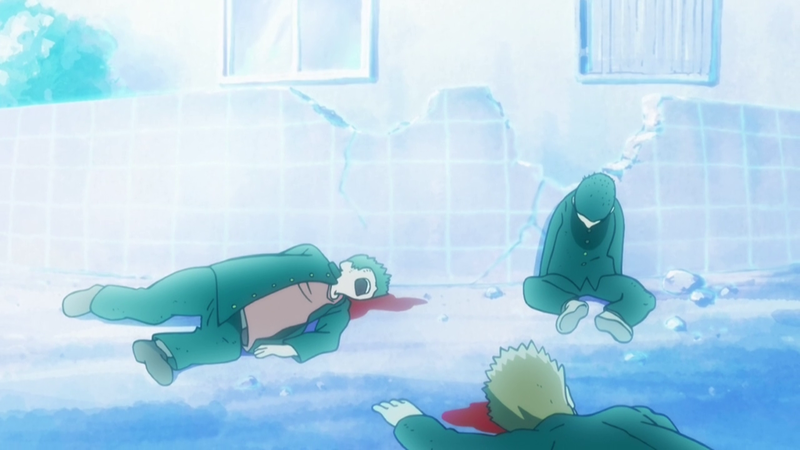 Every Mob Psycho 100 episode was produced at BONES. With tons of freelance talent and elements done by other studios of course, but no full outsourcing for any episode. If Flip Flappers resists, we’ll be 3/3 in that regard by the end of this season. It’s just that much more common to have fully outsourced episodes? Pretty much every show does. Extreme cases (like Jojo Part 4) can have just about as many as in-house ones.